Why do we take communion? How ought we take communion? The need for contemporary theological books on the Lord’s Supper is pressing, and fortunately Thomas Schreiner and Matthew Crawford have brought together a solid group of contributing authors to address it in The Lord’s Supper. Here’s a list of the contributors: Andreas Kostenberger, Jonathan Pennington, Jim Hamilton, Michael Haykin, David Hogg, Greg Allison, Matt Crawford, Shawn Wright, Bruce Ware, Greg Wills, Greg Thornbury, Ray Van Neste. While all the contributors are Baptists and many of the chapters come from that perspective, it would be a shame for this work to be overlooked merely for this reason, as all readers would benefit. Throughout this book, the Lord’s Supper is approached from a variety of angles: biblically, historically, theologically and practically. Three chapters are devoted to an examination of the Biblical accounts in the Gospels and Paul. Early Church history is then broadly surveyed, including sections devoted to non-Baptist understandings of communion. Final chapters examine the Biblical theology of remembrance, ethical implications of the Supper and finally, practical advice relating to how it should be practiced. The first chapter addresses the question whether the Last Supper with Jesus and His disciples was the Passover or a different meal. Kostenberger rightly discerns issues that at stake in this discussion include the theological significance of the meal and the inerrancy and historic reliability of Scripture itself. His chapter provides a helpful and fair treatment of the arguments against the meal being the Passover, responding to each and by providing a harmonizing of the Gospel accounts, concluding that it was in fact a Passover meal. Next, Jonathan Pennington tackles the Gospel accounts themselves; firstly, addressing questions of harmonisation (similar to that of Kostenberger’s essay) and then summarizing the Gospel’s teaching on the Supper. Five ‘nodes’ of meaning are identified in the accounts: a parable of Jesus’ impending sacrificial death, fulfilment of the Passover and exodus, the inauguration of the new covenant, the formation of Jesus’ community, and an appetizer for the Messianic eschatological banquet (44). Particularly interesting was his recognition that the Last Supper functioned as a multi-sensory parable, “something not just to be reflected upon and proclaimed, but also to be experienced with our senses” (45). My one issue is that the summary of the individual Gospel’s unique contributions followed what seemed to be the climax of the essay. This section felt tagged on and in my opinion, didn’t have much else to contribute by this point. However, Pennington had possibly the most difficult assignment in this book, and he skilfully brought everything together. James Hamilton sees Paul explaining in 1 Corinthians 11:17-34 that the, “Lord’s Supper is a proclamation of the gospel made by those who embrace the gospel” (68). To establish this, Hamilton surveys 1 Corinthians as a whole, drawing out the point that Paul addresses each of the Corinthians’ problems with the Gospel. This supports his claim that the improper behaviour of the Corinthians in taking the supper was caused by their lack of Gospel-centeredness; causing Paul to show them the implications of the Gospel for the supper, and re-establish its rightful central place in the believing community. 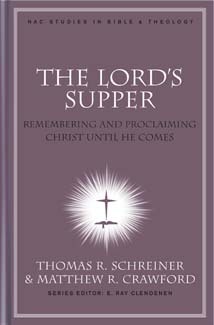 The largest portion of the book is addressed to the history of interpretation and practice of the Lord’s Supper. Haykin first summarizes the early patristic writings on the Supper, showing the centrality of the Supper in the early church. Hogg has an entire chapter on the differing views of two monks in the tenth century: Radbertus and Ratramnus. The views of the Catholic Church, Luther, Zwingli and the Reformed views are then discussed in their own respective chapters. Gregory Wills then gives a summary of interpretation and practice in Baptist churches, particularly detailing the transition from closed communion to open, and how that change reflected the mindset of liberal views infiltrating the church. As I am far from an expert in these areas, I won’t offer much critique. Allison’s chapter on the Catholic Church was particularly thorough and appeared to fairly represent their view. Ware’s chapter on Zwingli was also particularly strong and interesting. Both Allison and Ware succeeded in helpfully correcting common oversimplifications of Catholic and Zwinglian doctrine. Others unfortunately appeared to follow some of these misunderstandings of Zwingli in their own chapters. Wright’s chapter on the Reformed view seemed to be a little too broad and wasn’t able to interact as deeply with its subject. Will’s chapter on the history of Baptist views was very interesting but seemed to link open communion too strongly with liberal theology. Moving on to the theological section, Brian Vickers’ chapter on the Biblical theme of remembrance is worth the price of the book. He explores the implications of the supper being taken in remembrance of Christ, and his essay reveals many important insights. Particularly good was his focus on remembrance as actively partaking in God’s past faithfulness in the present, with hope for the future. Unfortunately, Thornbury’s essay wasn’t particularly strong. I couldn’t find a ‘purpose’ statement anywhere in his essay, and after reading to the last sentence I was mostly none the wiser as to what he was trying to say. I don’t think I’m the only one because all reviews I’ve read on this book avoided mentioning this chapter. Probably the most controversial chapter will be Van Neste’s. He is given the task of addressing practical application of the Lord’s Supper in the local church. The nature of this chapter guarantees that one will not agree with all the conclusions. Van Neste’s wisdom throughout this chapter is to be commended, but in some areas he overstates his case. For example, in regards to communion’s exclusive role in the local church, I believe he goes too far by stating that shut-ins should not be allowed to partake. Van Neste’s view that communion is only to be partaken amongst the local body sits in tension with texts like Acts 20:7 where Paul partook with believers at Troas during his travels. The fact that all authors are Baptists shouldn’t stop anyone from reading this book because a) the authors are not in complete agreement on every point, b) they are very thorough and fair in their research, and c) they represent and interact with the views of other traditions. This book is a wonderful resource for anyone wanting to have a better understanding of the Lord’s Supper Biblically, historically, theologically and practically. Many thanks to Jim Baird and B&H Publishers for sending me a review-copy of this book! So Paul Didn’t Write Colossians? Is The Book of Job a Chiasm?